Zimbabwe Cricket team (file photo). Williams, who smashed seven fours and three sixes, was involved in a fifth wicket partnership of 145 with stand-in captain Peter Moor (58 not-out) having arrived at the crease in the 22nd over following opener Solomon Mire's dismissal for 40. In-form left handed batsman Craig Ervine also provided the foundation for Zimbabwe's big total with his second half century, although he will be disappointed not to have converted his 64 off 71 balls into a century. 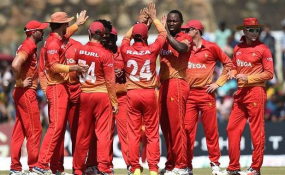 Allrounder Sikandar Raza (two for 44) and seamer Kyle Jarvis (two for 20) also combined to stifle the visitors 'run chase by making scoring difficult and taking wickets at regular intervals.